For the third year running, the Master RSP (Research Study Program) of the Istituto Europeo di Design has presented a full-scale concept car at the Geneva Motor Show. The Master course introduces the students into a totally realistic work environment, simulating the kind of teamwork encountered in a professional design studio equipped with the latest and most innovative computer systems, thus essentially setting up their own experimental design lab. 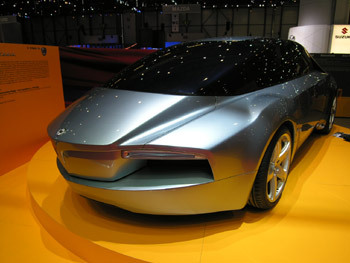 For each Master course a Style Centre commissions IED to develop a concept car project. The students, stemming from around the world, must pit their wits and collaborate together in carrying out the project just like a professional styling team might, tackling all the problems that are typically faced by a Style Centre right up to the presentation of a final full scale model. This year the project formed a tribute to Lancia, a brand currently celebrating their Centenary. 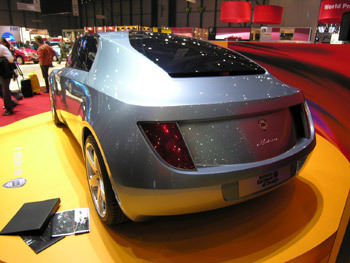 The concept car, called Haizea, was set up with the intent of initiating a research project, to be developed within the context of a Post-Graduate Course, analyzing the identity of the Lancia brand, with the aim of identifying the values that best represent the image of the manufacturer. The project, which started with the analysis of various identities associated with Lancia over the past century, materialised with a concept car developed around a frame structure devised in such a way to offer the utmost level of both passive and active safety. The engine is centrally mounted, giving rear-wheel drive, however two extra hub-mounted electric motors located at either front wheel give an excellent compromise in terms of weight distribution, traction and mass. This particular chassis structure, ‘dressed' externally in such a way as to highlight the vehicle's architectural values, plays an asymmetrical disposition of the vehicle's masses in order to induce a strong sense of movement. This movement recreates a feeling of speed, thus arousing the sensations of an encounter with wind (Haizea = wind in the Basque language). The full scale model has the following dimensions: length 4965 mm; width 1935 mm; height 1420 mm; wheelbase 2720 mm.